Casas Espania is the leading independent Real Estate Agents situated on the Costa Blanca in Spain. Following a record year, since moving into their current office, Casas Espania will be relocating its La Siesta based Head Office. 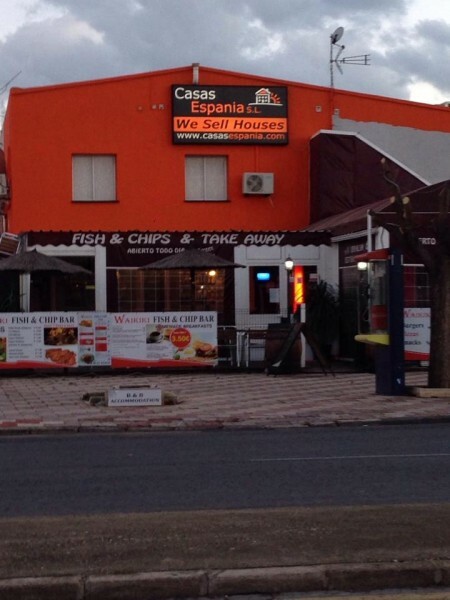 Having outgrown its old premises Casas Espania will be expanding into a bigger and better building in February 2014. Remaining in La Siesta, its new location will be only across the road at what is now called Bar Waikiki. This expansion sends a positive message to their clients and customers, showing that they are putting them at the heart of everything they do. The new building is five times the size of the current office and has a dominant position on the edge of the La Siesta roundabout. There will be no way you could drive past the building without seeing the Casas Espania sign. Also the new office will have extremely valuable parking spaces for their clients. Casas Espania is headed by well experienced, three working directors. This ensures the service and professional standards on which they built their business are rigorously maintained. They are supported by a team of professionals who emphasise the company’s commitment to providing high levels of customer service and to making life easier for their clients. Casas Espania have a wealth of experience in finding the best property to suit their clients’ needs and pride themselves on the fact that all of their clients remain part of the Casas Espania family. So whatever assistance they need before, during and after the purchase of a property and any legal issues will be handled in a professional manner, making customer service their highest priority. The expansion will also allow Casas Espania the opportunity to combine global expertise and local knowledge to market their properties in Spain to non EU investors. Casas Espania looks forward to meeting buyers, sellers and new customers, as well as seeing lots of familiar faces.